The Wall Finder function attempts to determine where the corner of the floor and the wall meet. 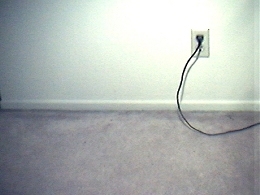 It assumes that the camera is looking at the floor such that the floor is seen at the bottom of the image. The function looks for the transition between the floor texture and the wall texture and indicates that corner using a red dot. 1. You can change the window size that is used to determine the floor/wall texture in case you need to increase/decrease the sensitivity.